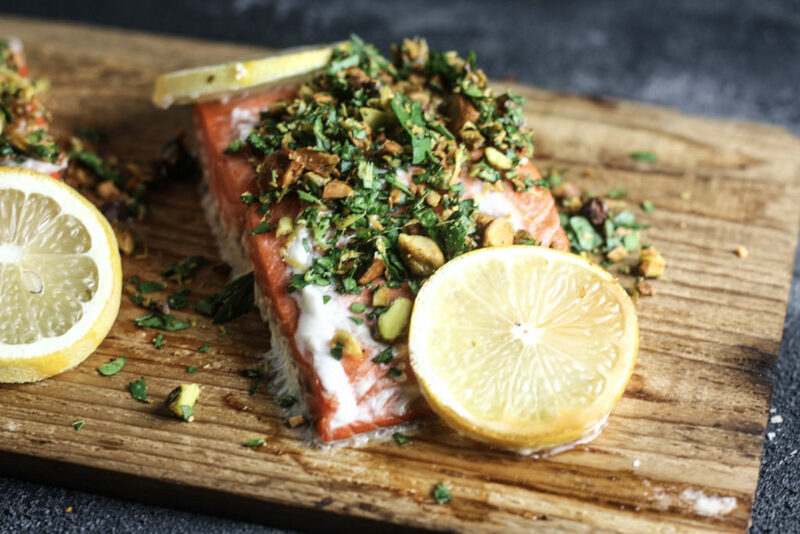 This Salmon with Avocado Gremolata is cooked on a Cedar Plank with Lemon slices to create a citrusy and perfectly cooked Salmon filet topped with Pistachio Gremolata. This post is brought to you by Prestige Food Trucks a custom builder of food trucks that has been featured on CNBC and The Food Network. People keep trying to tell me Summer is almost over and I keep saying noooooooooo and holding on for dear life. Summer ain’t over ’til I say it’s over. Jk. But really, I am looking forward to cooler days, getting back in the groove of working and things calming down a little. Summer is all go-go-go but I find Fall is typically a time to start slowing down and a great time to really get to work. Of course, before Summer officially closes and I can start relaxing, I’ve got to go to Las Vegas to pick up our Hiker trailer and then off to China for the World Roller Games! I’m really looking forward to both trips. In the meantime, while I’m still embracing the Summer way, I’m grilling up a storm. 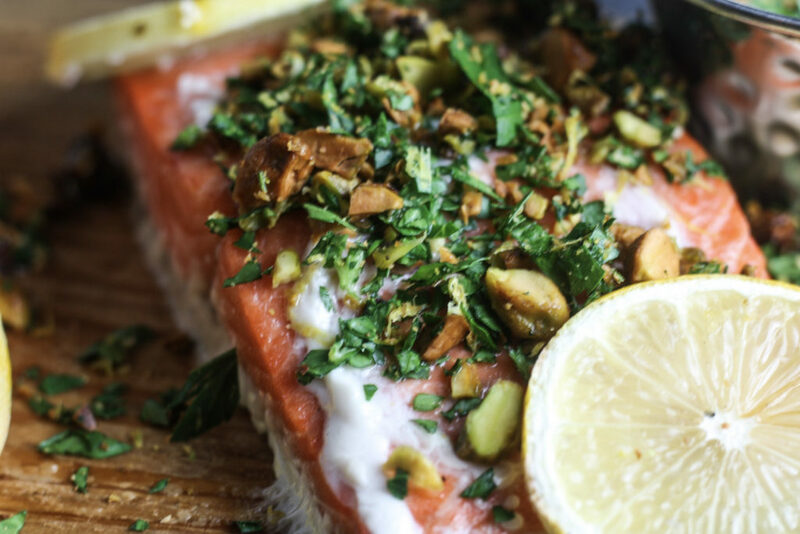 Using cedar planks on a grill is one of my favorite ways to cook Salmon because to me it just screams Summer. Plus it’s nice to be able to cook the entire meal on the grill outside and not have to turn the oven on in the house and make it hot! Make sure you soak your Cedar plank for at least an hour prior to putting on the grill. This is important so that it doesn’t light on fire or burn while you’re cooking. 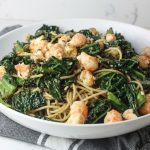 For those unfamiliar, Gremolata is a chopped herb condiment usually with lemon zest, parsley and garlic. 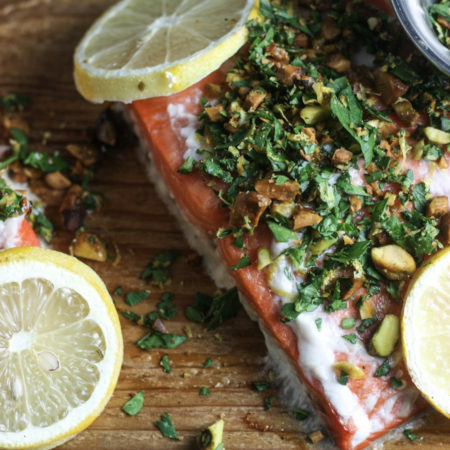 In this recipe, I’ve added chopped pistachios to the gremolata. 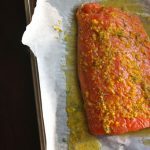 I find it gives the salmon a lot of good extra flavor and the pistachio helps add some crunchy texture which I find welcoming! Put cedar plank in water for at least one hour prior to cooking. In a bowl, add chopped pistachios, parsley, zest of 1 lemon and minced garlic. Mix well and set aside. Slice lemon into ¼" thick pieces (it's fine that the zest is gone). Season the salmon with salt and pepper. Lay lemon slices on top of filets. 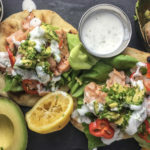 Put salmon filets on cedar plank and stick cedar plank on a grill over medium-high heat. Close lid on grill and cook for 5-7 minutes. Open grill and check for doneness. If not quite done, close lid and cook a little longer. 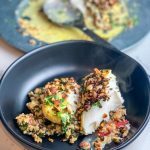 Depending on the size and thickness of your filets, cooking time may vary. 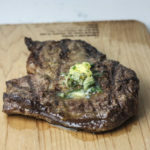 Once cooked to your liking, take off grill. 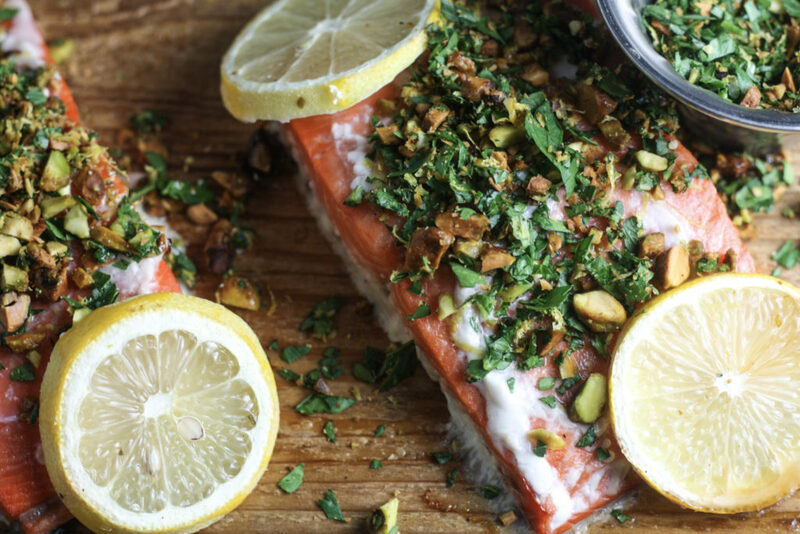 Top salmon filets with pistachio gremolata. 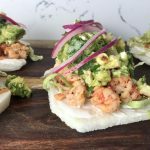 Serve with extra lemon wedges. « Albus’ 3rd Birthday + a Pupcake Recipe!